Slate Roofing Tiles Are Natural, Durable, And Simply Beautiful. Is it about time to choose a new roofing system for your home? If you're searching for a roof system that will protect your family for generations, and you're ready to invest in the longevity of your house, we may have the ideal roof system for you. 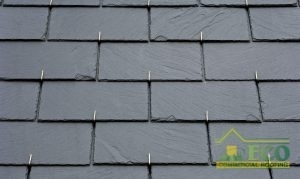 Slate tiles are very possibly the best residential roofing material on the market, in durability and longevity. Interested in learning more about the slate roof and slate roof installation in Texas, Louisiana, and Mississippi, TX? Give our professionals a ring at (833) 200-0571! With significant experience offering exceptional slate roof solutions to this community, ECO Commercial Roofing has the roof professionals you can trust! Slat Tiles Require A Very Particular And Precise Installation Process. Within residential roof systems, tiles are considered an exceptional choice, but slate tiles in particular are recognized to be the best type of tile you can choose. Different from every other tile roof material, you can bet on your slate roof to last for more than 100 years in ideal conditions. This is because unlike man-made tiles such as clay or concrete, the natural slate is exceptionally resilient, and cannot be duplicated in other materials. Protected from mildew and fungus growth, slate tiles are even non-combustible, so your home has additional protection from fire. And when you choose ECO Commercial Roofing to assist you with your slate roof installation, we have a wide selection of designs and looks to choose from, that will add value and curb appeal to your house for years to come. While slate roofs provide many benefits, you can only expect those benefits if your slate roofing is installed properly by an experienced contractor. A poorly installed slate roof will be susceptible to a laundry list of costly and frustrating repairs. At ECO Commercial Roofing, our contractors have years of expertise installing slate roofs on homes, and we understand the importance of precise application. For a long time, our slate roof installation in Texas, Louisiana, and Mississippi, has been among our specialties. Give us a ring today at (833) 200-0571, and talk with any of our contractors to begin.